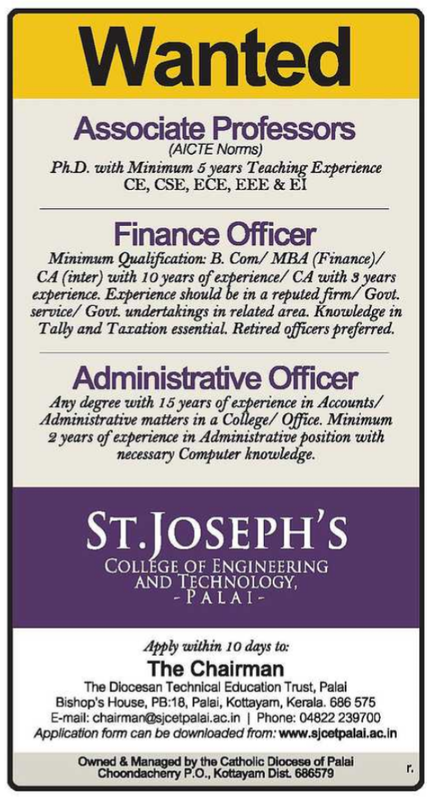 St.Joshep's College of Engineering and Technology,Kottaiyam,Kerala has advertised for the recruitment of Teaching Faculty-Associate Professors non teaching faculty jobs vacancies. Interested and eligible job aspirants are requested to apply with in 10 days. Check out further more details below. Name of the College: St.Joshep's College Engineering and Technology,Kottaiyam,Kerala. About College: The establishment of St. Joseph’s College of Engineering ,was the fulfillment of a long cherished dream of providing facilities for higher education to the people of the diocese and surrounding regions. The main objective is to develop a college with a distinct identity and character, where education and training are imparted in a truly Christian environment conducive to fostering Christian values such as faith in God, love for their fellow men and devotion to the motherland. Every facility is provided in the campus to create an environment fully conducive to realizing this objective. Ph.D with 5 years of experience. Financial Officer:B.Com/MBA(Finance)/CA(Inter) with 10 yrs of experience/CA with 3 years of experience. Experience should be in a reputed firm/Govt services/Govt undertakings in related area. Knowledge in Tally,Taxation essential,retired staffs preferred. 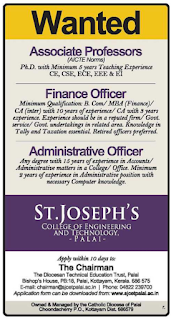 Administrative Officer: Any degree with 15 years of experience in Accounts/Administrative matters in college/office. Minimum 2 years of experience in administrative positions with necessary computer knowledge. How to Apply: Interested and Eligible candidates may apply with in 10 days.